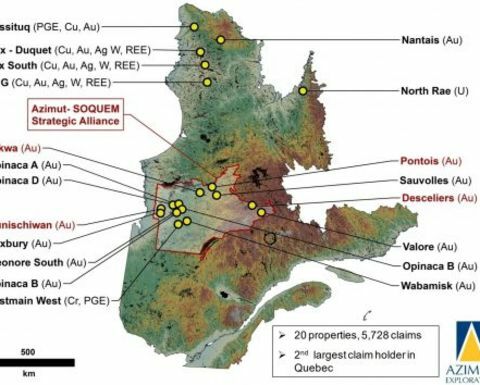 A strategic partnership between Quebec-based junior Azimut Exploration (TSXV:AZM) and provincial government-owned SOQUEM, a subsidiary of Ressources Québec, has made a new gold-copper discovery in the James Bay region of the province. First-pass prospecting on the Pontois property returned best results of 6.02 grams per tonne, 2.56gpt and 0.9gpt gold. Grab sample values also included up to 2.61gpt silver and up to 23.7gpt tellurium. The partners reported "significant" copper values of up to 0.18%, 2km from the prospect, along the same geological trend. According to Azimut, gold is hosted in mafic metavolcanics and intrusive dykes with quartz veins, near a sheared contact with metasediments. The intrusive facies contain disseminated fine pyrite. The 40x20m sector is open along strike in both directions and will be the focus of detailed follow-up field work in 2019. 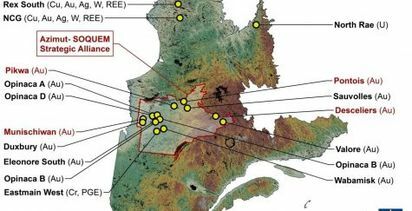 Azimut, which holds one of the largest exploration portfolios in the James Bay area, made the discovery by applying its predictive mineral potential modelling of the 176,300-square-kilometre expanse. The same modelling technique also resulted in the recent Munischiwan and Pikwa discoveries. 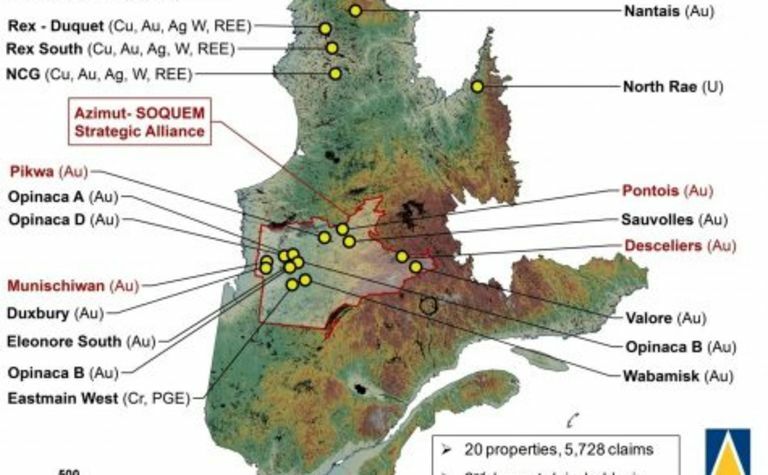 Several juniors are attempting to replicate the success of the Éléonore gold discovery by Virginia Gold Mines in 2004 in metamorphic rocks near the contact between the La Grande and Opinaca geological sub-provinces. The emerging gold camp has attracted the attention of the majors, including Goldcorp which bought the multi-million-ounce mine in 2005 for C$420 million. The region is benefitting from infrastructure projects under the auspices of Plan Nord, a commitment by the province to spend about $1.3 billion on infrastructure and other projects by 2020. Azimut has not been spared the recent junior market investor malaise and has lost about 28% of its value over the past 12 months, including a 4% slide Thursday to 23.5c - a hair above its 12-month low of 23c.